The big picture: Using new, high-resolution data of ocean currents at and near the glacier's floating ice shelf, NASA researchers were able to show that an influx of cooler waters since 2016 has slowed — but not completely halted — Jakobshavn's rapid melt. The glacier is still adding to global sea level rise, since it continues to lose more ice to the ocean than it gains from snow accumulation, but at a slower rate. The study is based in part on high-resolution data gathered during NASA's Oceans Melting Greenland (OMG) mission, as well as other observations. 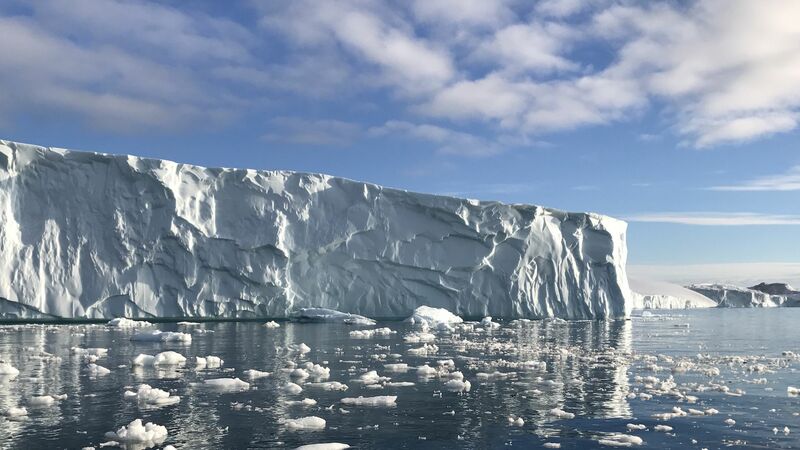 The OMG mission is aimed at obtaining temperature and salinity data in the vicinity of rapidly melting Greenland glaciers, since it's been shown that relatively mild ocean waters are eroding glaciers' ice shelves from below in both Greenland and Antarctica. The intrigue: A key suspect in causing the glacier's slowdown is a regional climate pattern that causes the North Atlantic Ocean to alternate between warm and cold temperatures. Ocean temperatures in Disko Bay's near-surface waters have cooled to levels last seen during the mid-1980s, the study found. What they're saying: "At first we didn't believe it. We had pretty much assumed that Jakobshavn would just keep going on as it had over the last 20 years," says lead author Ala Khazendar of NASA's Jet Propulsion Laboratory in California, in a press release. However, the OMG data showed cold water near Jakobshavn for three years in a row. "Jakobshavn is getting a temporary break from this climate pattern. But in the long run, the oceans are warming. And seeing the oceans have such a huge impact on the glaciers is bad news for Greenland's ice sheet," Josh Willis of JPL, the principal investigator of OMG, explained.